Services: branding, responsive website, web design. Curious Design were set the task of simplifying a complex organisation like ours into a user friendly and attractive website. Not at all an easy job! Marie really grasped our culture and way of working and patiently included us in her process. We built up a good working relationship and got wonderful advice and results from using a designer with a keen eye and a listening ear. We are thrilled with the new site and get great feedback on it from our clients. 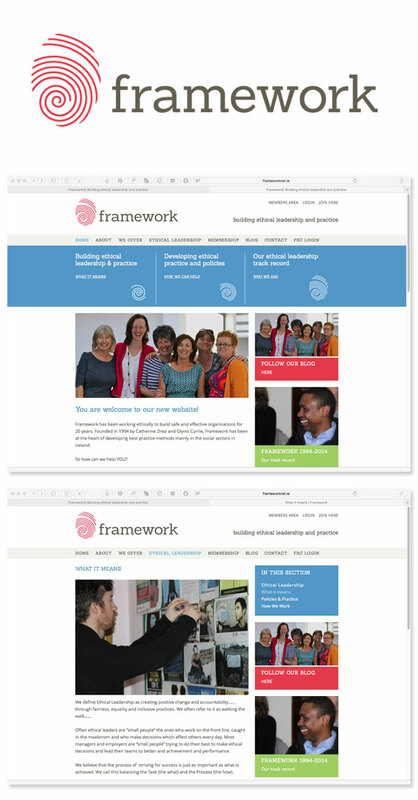 Framework came to us looking for a branding refresh and a website redesign. We worked with the team to modernise and redesign their logo and to develop a new responsive website which they can easily maintain and update themselves.